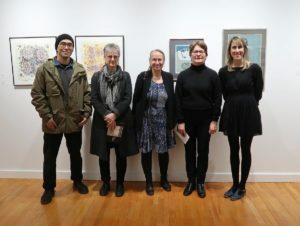 Takuji Hamanaka and April Vollmer traveled to Schenectady in upstate New York to work with students and give a gallery talk for the exhibition “Mokuhanga: Impressions Past and Present” curated by printmaking teacher Sandy Wimer and art historian Sherry Lullo. Sandy had studied Japanese woodcut printmaking at the Mokuhanga Study Center at Whitman College in Walla Walla last summer and brought her knowledge to students at Union. More photos of the exhibition. This site is designed to foster a better understanding of mokuhanga, Japanese woodcut printmaking, and to provide a location to share expertise and information. The IMA is an international organization with its Head Office in Tokyo. This site is designed to foster a better understanding of mokuhanga, Japanese woodcut printmaking, and to provide opportunities to share expertise and information.